Traditional Uses: Pens, Knife handles, Gun Grips, Inlay, and Musical Instruments when possible. Infrequent availability combined with small size usually limits this species to the role of accent wood. View Afzelia Xylay For Sale Now! 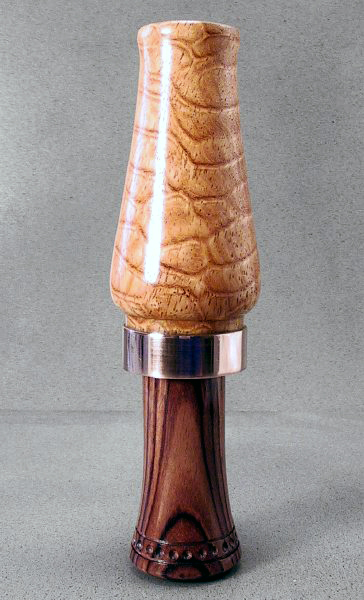 Afzelia Xylay is one of the most coveted woods on the market due the highly unique lace pattern that infrequently develops during the trees growth cycle. This deep impression lace pattern is reminiscent of tunnels forged within an ant colony and is instantly recognizable. Heavy blister figuring is also commonly found mixed into this prized pattern. These elusive patterns are further compounded by the extreme three dimensional chatoyance this species exhibits. Color tone ranges between bright tangerine and warmer reddish browns with occasional darker streaks appearing throughout the timber. This wonderful signature figuring combined with a saturated color tone put this timber in a class of its own! Unfortunately, this species finds itself limited to the realm of accent wood & smaller craft items because rarely does it present itself as large board stock on the market. Afzelia Xylay is moderately dense material that is known to quickly dull blades. The wood is Interlocked and open grain therefore a sanding sealer is recommended prior to finishing. Medium texture, with natural luster and heavy chatoyance. Tone Qualities: The tonality of Afzelia Xylay is characterized as an even tone with rich basses, clear mid-tones and crisp trebles.